A sizzling weekend saw 37 professionals join 99 locals for the annual Recreational Services Eketahuna-Masterton ProAm. Very tricky conditions at Eketahuna saw a local team maximise opportunities and race out to a 10 shot lead. The rest of the field were very tightly bunched so it was all on for Sunday. Good scoring was the way of the day with many teams cutting into Saturday’s lead. 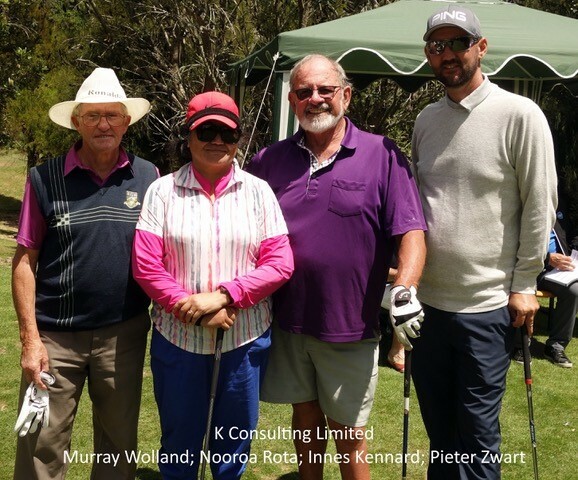 In the end the Ekatahoons and K Consulting were tied on 248 with K Consulting narrowly winning the 9 hole count back by 2 strokes. While 3 holes spoilt his weekend a key team factor for the winners were the 11 birdies shot by pro Pieter Zwart. All in all a brilliant weekend of golf with both courses presented in magnificent condition.